It’s here! West Seattle Community Garage Sale Day 2016 has arrived! 9 am-3 pm, 320+ sales are happening all over the peninsula. More updates once things get going! One week from now, hundreds will be selling, thousands will be shopping, from Duwamish Head to Brace Point to White Center to Highland Park, on the 10th annual West Seattle Community Garage Sale Day. As promised, you’ll be able to see the map here later today – and it will include the sale numbers, so sellers can start telling everyone they know to come see them at sale # (etc.). We’re also e-mailing the “packets” to sellers this morning, with various info, and we’re post-office-bound with hard-copy packets for the handful of the sellers who requested that version. <blockquote>Motivating and exciting students is an important part of education at Denny International Middle School and the other schools in West Seattle. One of the easiest ways to motivate students to read is to have books they are excited about reading. We are seeking donated books to help us to match each student to many appropriately-leveled high-interest books. Your book donation would help us with our efforts. 1. We will have a truck marked Denny Middle School in the West Seattle Junction across from Junction True Value from 3 to 6 PM on May 10th. 2. Hotwire Coffee – 4410 California Avenue SE, any time during open hours thru May 18th . … Note: Hotwire Coffee, as part of its support for the West Seattle community, will give a certificate good for $1 off any purchase at Hotwire to the first 25 people who drop off 10 or more books. 3. Bank of America, West Seattle Branch, 4001 SW Alaska St, 358-2230, from 10-6 M-F, Sat 10-1, thru May 18th. 4. Roxbury Bowling Lanes, 2823 Roxbury St, 935-7400, from 11 AM to 7 PM, thru Sunday, May 18th … Note: Roxbury Lanes, as part of its support for the Seattle community, will give a certificate good for two people for two free games of bowling for any book donation over 20 books. 5. Denny International Middle School, 2601 SW Kenyon St, 252-9000. Drop off at the front desk, from 8:00 AM to 3:00 PM Monday to Friday, thru Friday, May 16th. This information is also in the packet going to sellers and will be mentioned on the map pages too, here and on WSB. Mapmaking is in its final stages, after we proofread all 280+ listings. Starting Friday (as in, hours from now) we will roll out some final info – from how you can participate in donation drives on West Seattle Community Garage Sale Day, to collection drives post-sale, to the info packets that we’ll send to participants. It’s all about logistics now – including your help in making sure friends and family know about it, so they can come wander West Seattle’s miles of sales on Saturday, May 10th. Check back here for updates, and watch WSB too! Getting closer! 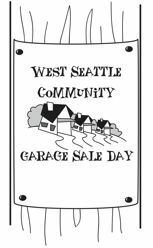 Another shopping-and-selling extravaganza is in the works for Saturday, May 10th, with 90 sales now on the list for the 10th annual West Seattle Community Garage Sale Day! You in? Go here to sign up.